Unique retirement gifts come to mind when someone you know nears the age of retirement. You don't want to give the same thing everyone else will be giving. You want a gift that will stand out from the crowd. A gift so unique and interesting, everyone will want to know where you found it. This may be a close friend you have spent many hours, days and maybe even years with - someone that has come to mean a great deal to you. Someone you will surely miss not seeing every day. Even if the retiree is not a close friend, just someone you happened to have worked with, you want to give them a retirement gift, ideally which shows them that you are a kind and caring person, and even though the two of you never became close friends, you wish them well on their accomplishment in their life’s work. If you have socialized outside of your working relationship, then the decision gets even tougher. Then you want to give a gift that is even more personal and not just the first item you see in the “fabulous retirement gifts” section of the store. Finding the right retirement gift, or any special gift for that matter, can be challenging. You want your retirement wishes to express how you feel but also to give a gift that suits the person you are giving it to. What are you trying to say? You want to wish the new retiree health and happiness and a long retirement, right? You want them to know you have put some real thought into a gift that reflects the person who is retiring and to acknowledge that you recognize that there may be profound life changes close on their horizon (which is also now full of adventure). But what gift can you give that will transmit or convey this? Captured Wishes has unique retirement gifts! Captured Wishes are super chic and unique gifts designed for your special person and for your special occasion. 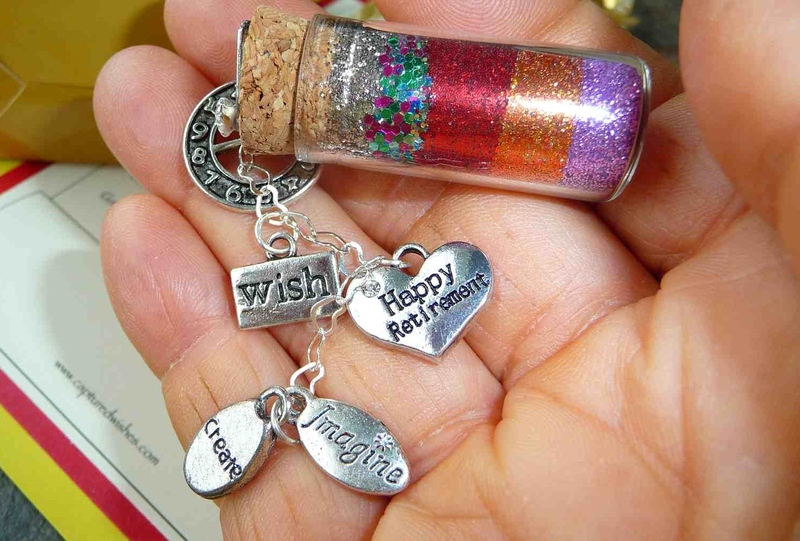 Each little wish gift is a beautiful miniature glass vessel filled with specially selected magic dust that expresses exactly what you feel in your heart. Each vessel is carefully assembled by hand, each colorful layer poured with your thoughts and wishes in mind. Accompanied by special charms, heart-link chain, and a meaningful verse which ties all the symbolism together, your friend will be able to use the wishes whenever they want or need a little pick-me-up. Small enough to fit the palm of one's hand, Captured Wishes' unique retirement gifts can be tucked away in a suitcase or glove box. They don't take up much space but the love and warm wishes this vessel holds and represent are huge! Whether your retired friend travels or not, whatever adventures life has in store, they will always be reminded of you and the sincerity of your intention. Their heart will glow with love and joy every time they take out the special little vessel, read the verse and think about their desires, their wishes, their longings, their accomplishments. When you want a gift that is truly unique, a gift that will be cherished forever, then give the gift that lasts – unique retirement gifts from Captured Wishes are the perfect gift for any person and for any occasion.